Multilevel Coordination in EU Energy Policy: A New Type of “Harder” Soft Governance? This chapter deals with a new trend in European governance which combines soft governance mechanisms with harder elements in order to enhance the EU’s capacity to steer in areas with limited European competences. 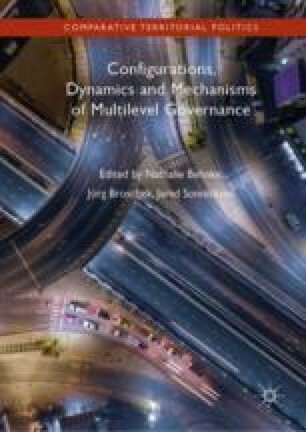 It first develops theoretically a new type of governance, the ‘horizontal joint decision-making+’ in comparison with other types of multilevel governance. Energy policy was chosen as one of the areas where the new type of governance can be detected. The policy field is characterized by only limited competences at the EU level and no competences when it comes to decisions concerning the energy mix of the member states. Within the legislative package “Clean Energy for All Europeans” the EU designed an energy governance regulation which focuses on a better coordination of national energy policies. Despite the recourse to the soft method of open coordination, the regulation contains elements of a more binding and “harder” nature, potentially leading to the point of intervening in the national energy mix of Member States. This chapter analyses the steering potential of the EU Commission through “harder” soft governance in the multilevel system in an area of limited European competences. Barreto-Gómez, L., Schenk, C., & Althavale, S. (2016). Concerted Action on the Renewable Energy Directive: Executive Summary. http://www.ca-res.eu/fileadmin/cares/public/Reports/Final_Executive_Summary/CA-RES_Executive_Summary_2016.pdf. Accessed 3 March 2017. Coalition for Energy Savings. (2013). Coalition Guide to the Energy Efficiency Directive. http://eedguidebook.energycoalition.eu/images/PDF/EED.pdf. Accessed 3 March 2017. Meyer-Ohlendorf, N. (2015). An Effective Governance System for 2030 EU Climate and Energy Policy: Design and Requirements (Discussion Paper). Ecologic Discussion Paper Series, 1–25. http://ecologic.eu/sites/files/publication/2015/meyer-ohlendorf-15-effective-governance-syystem-2030.pdf. Accessed 3 March 2017. Nesbit, M. (2014). Getting Delivery Right: The EU 2030 Climate and Energy Targets and the Challenge of Governance. http://www.ieep.eu/assets/1659/IEEP_EU2030_governance_paper.pdf. Accessed 3 March 2017. Suomi, U. (2015). CA EED Reports—Core Theme Series Reports Covering Work from January 2013 to March 2015. http://www.esd-ca.eu/outcomes/core-theme-series-reports/ca-eed-reports-covering-work-from-january-2013-to-march-2015/(theme)/7040. Accessed 3 March 2017. Turner, S. (2015). Embedding Principles of Good Governance into the 2030 Climate & Energy Framework. https://www.foeeurope.org/sites/default/files/renewable_energy/2015/turner_2015-six_principles_of_good_governance.pdf. Accessed 3 March 2017. Turner, S., Genard, Q., Roberts, J., & Luebbke, I. (2015). Four Key Messages for the Governance of the European Climate and Energy Policies After 2030. https://www.e3g.org/docs/E3G_Four_Key_Messages_for_the_governance_of_EU_climate_and_energy_policies_after_2020_V2.pdf. Accessed 3 March 2017. Umpfenbach, K. (2015). Streamlining Planning and Reporting Requirements in the EU Energy Union Framework. http://ecologic.eu/sites/files/publication/2015/planning_reporting_ecologic_institute_final_20150908_2.pdf. Accessed 3 March 2017. Wilson, A. B. (2017). Briefing: Governance of the Energy Union. European Parliamentary Research Service, 1–8. http://www.europarl.europa.eu/RegData/etudes/BRIE/2017/599279/EPRS_BRI(2017)599279_EN.pdf. Accessed 2 March 2017.